After kick-starting the electric car market in America with its high-priced luxury vehicles, Tesla has been attempting to transition to the mass market by making cheaper vehicles in larger numbers. It has been a rocky road, but the Model 3 is now the bestselling plug-in electric vehicle in America. Musk has consistently emphasized that his goal for Tesla is not just financial success, but a transformation of the way the world travels — replacing cars that run on fossil fuels and contribute to climate change with electric vehicles, which can be powered by renewable energy. The company's goal is "important for all life on Earth," he told employees Friday. "Succeeding in our mission is essential to ensure that the future is good." But that kind of transformation won't happen if Tesla makes only pricey luxury cars for elite customers. Musk is still determined to boost production of midrange and lower-priced versions of the vehicle. He has promised a $35,000 vehicle to consumers, but so far, the cheapest Model 3 is $44,000. Then there's the rise of competition. Electric vehicles are still a very small fraction of new car sales, but they're growing. And the market currently dominated by Tesla is going to get increasingly crowded, as traditional automakers prepare new plug-in models that will roll out over the next few years. "The road ahead is very difficult," Musk said. "This is not new for us — we have always faced significant challenges — but it is the reality we face." 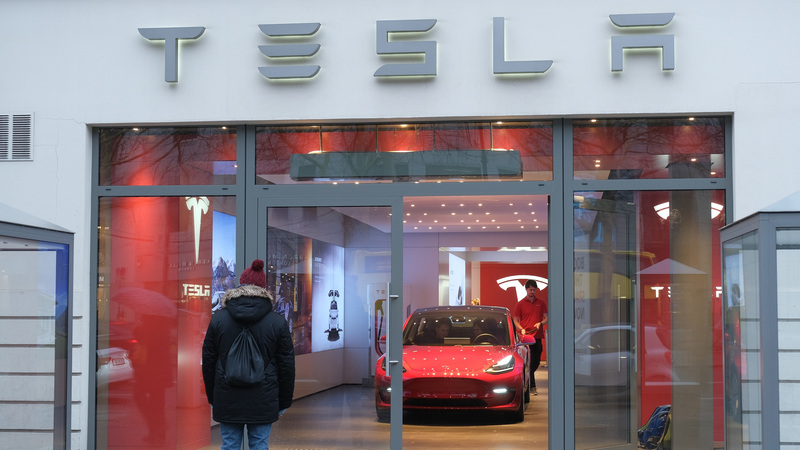 Given rising costs and competitive pressures, cutting staff is a "practical, traditional" step for Tesla to take, says Jessica Caldwell, the executive director of industry analysis at Edmunds. Which is to say, it's a bit of a surprise considering that Musk is not exactly renowned for being practical or traditional. "When you're talking about a company that builds tents to solve production challenges, it's almost more notable when you see them doing something conventional," Caldwell says. Tesla stock was down nearly 11 percent Friday afternoon, but investment analysts were largely pleased with Musk's announcement, arguing that the cuts will leave Tesla better positioned for future profits. "Tesla needs to operate more efficiently and sell cheaper models to survive and ride the growth of EVs," Gene Munster and Will Thompson of Loup Ventures wrote. "Musk's focus appears to be shifting to profitability."